Does the thought of putting yourself first shock you? Scare you? Make you angry? The classic example of putting yourself first comes from the airlines. 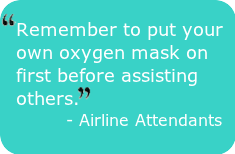 Before every flight, you’re reminded to “Secure your own oxygen mask first.” First! Before assisting others. It makes sense on an airplane. And it makes sense in your daily life. Even though it makes sense, it still might seem wrong, selfish, even scary. Especially to a parent or to a caretaker or to a people-pleaser. Like the divorced mother of two who had been putting her children first so they’d love her more than their dad. The more she “needed” their love, the more out of alignment she was and the more they wanted to be with dad. As she started putting herself first, she became their fun, happy mom again. Like the new lawyer who had been working around the clock trying to impress the partners. Shocked to receive a mediocre performance review, he realized that putting in the time from a low vibration was counterproductive. When he started taking care of himself by getting exercise, sleep and a social life, his next review was superior. Like the 40-something single woman who had spent her life trying to please her demanding mother while ignoring her own needs and desires. Dissatisfaction with her life finally gave her the courage to set boundaries and start saying NO. After her mother stopped grumbling, their relationship improved and my client began creating her own life without feeling guilty. you don’t have anything to give anyone, anyway. Putting yourself first is good for your health. When you take care of your mind, body, spirit, you enhance your immune system and allow your natural state of Well-Being to flow. Putting yourself first is good for your relationships. You might think you have to put all the others in your life first in order to maintain good relationships. Turns out, it’s the exact opposite. Take good care of yourself and you’ll have more to give others. Then everyone wins. Putting yourself first is good for your career and your pocketbook. You’re more effective when you put yourself first. When you’re happy and healthy, you can breeze through projects that would take you hours and hours from a place of overwhelm and exhaustion. Wondering how to start putting yourself first? Put yourself first by taking good care of your vibration. What you vibrate is what you have to give, which means that what’s good for you is also good for others. 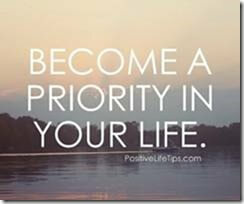 Put yourself first by making your relationship with your Inner Being your top priority. Fill yourself up from the inside out before you offer support to others. Put yourself first by being Who You Really Are. Living your best life and expressing your full magnificence provides the Life Force Energy to easily and joyfully contribute to others. As you take good care of your vibration, filling yourself up from the inside out, you align with Source. When you align with Source, everything unfolds perfectly for everyone involved. put yourself first, vibration. Bookmark.